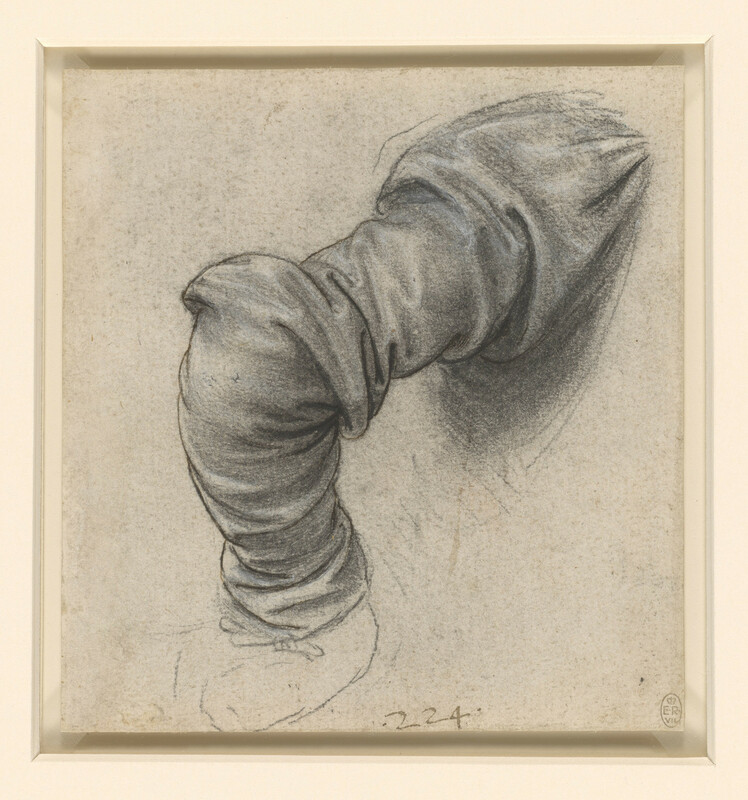 A study of a right arm clothed in a sleeve of thick fabric, bent at the elbow, as though resting on the hip of a figure turning to the right. This is the only known drapery study for Leonardo's painting of the Last Supper. It shows St Peter’s arm twisted behind his back as he leans over Judas’s shoulder. Melzi's 224. Leonardo’s greatest work to reach completion was the Last Supper, painted for Ludovico Sforza in the refectory of Santa Maria delle Grazie in Milan. This revolutionary exercise in the depiction of emotion shows the reaction of the Disciples to Christ’s announcement of his imminent betrayal. The painting was complete by 1498, but Leonardo’s experimental technique combining oil, tempera and varnish was soon deteriorating, and what we see now is a ghost of his intentions. Leonardo must have executed many drawings as he refined the composition, but only a handful survive.